Good morning! The Simon Says Stamp September Card Kit: Sea Treasures is now available and it is MERMAZING!!! 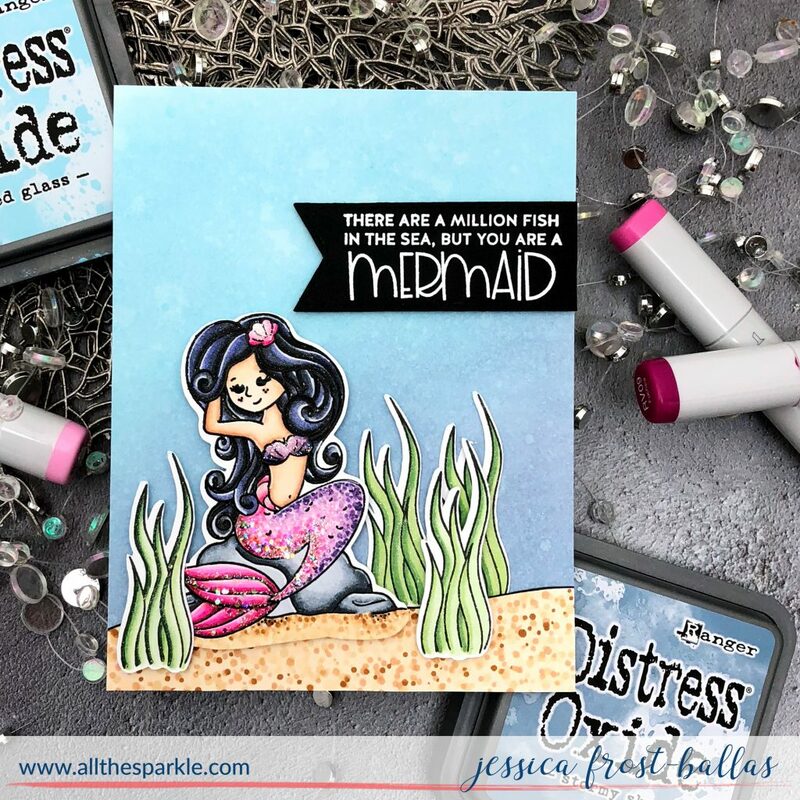 I love that the mermaids are a good size for easy copic, pencil, or water-coloring and I really enjoyed practicing my coloring with these gorgeous stamps! 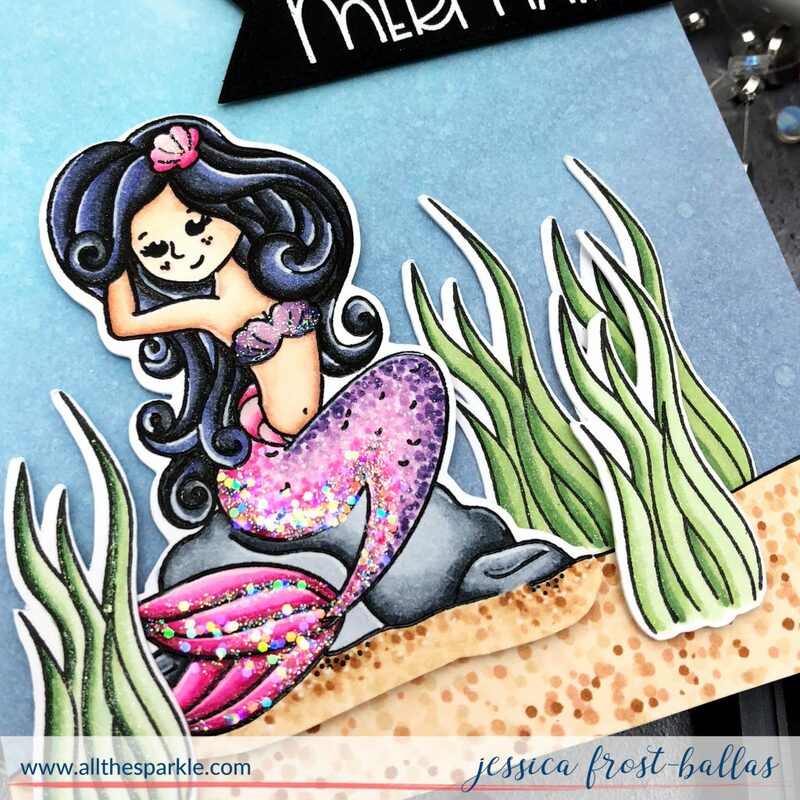 For my first card I stamped the mermaid with versafine and heat-embossed her with clear embossing powder before coloring her with copics. I also stamped several of the seaweed plants and colored them with copics. I die-cut the images and then added accents with a white gel pen, spectrum noir clear sparkle, and the super sparkly copic spica pens! Next I blended stormy sky and tumbled glass distress oxide inks onto a piece of white cardstock to create my ocean. I spritzed it with water and blotted off the excess water to create bubbles! I used copic markers to create a sandy ocean bottom and fussy cut it. Next I adhered it to my distress oxide background and tucked in the seaweed and mermaid with a mixture of regular ATG adhesive and foam mounting tape. Then I added a little nuvo crystal glaze and sprinkled parts of the glaze with prisma and chunky glitter for extra sparkle! 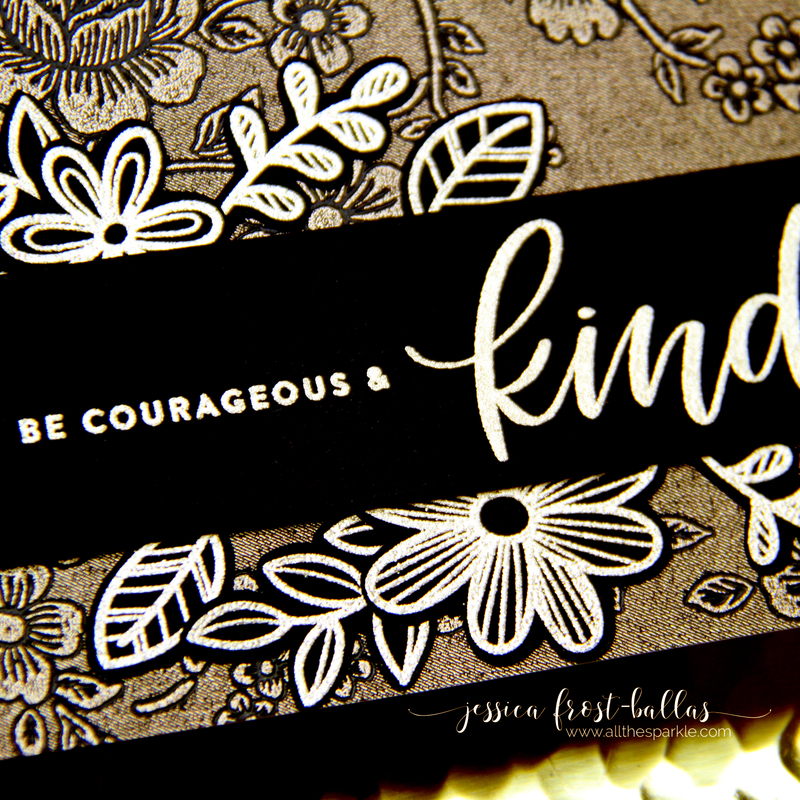 To finish the card I stamped the sentiment and heat-embossed it with white embossing powder. 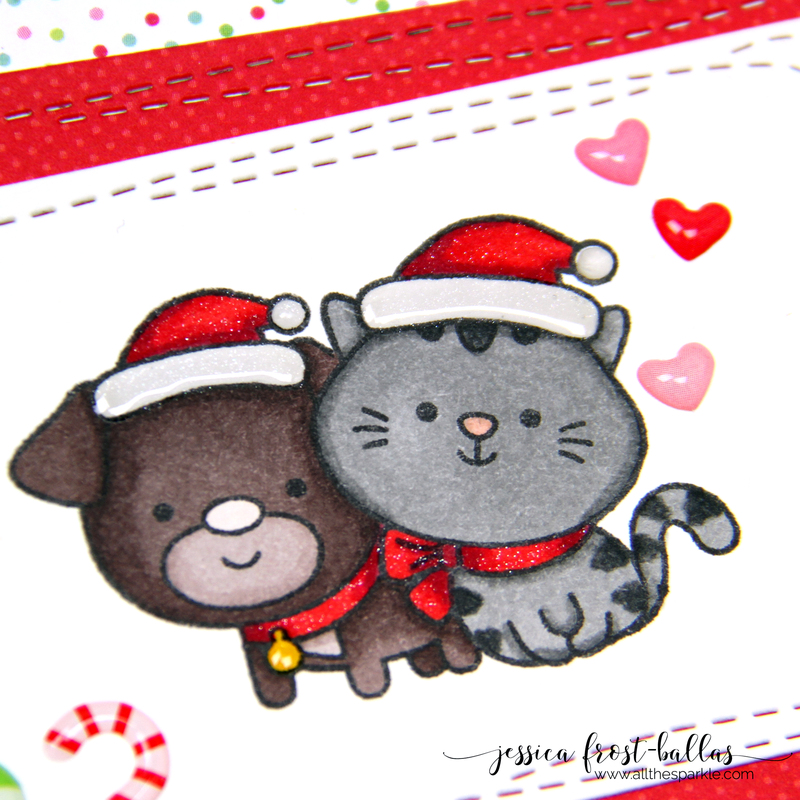 I die-cut it with a fishtail banner and then adhered it to the card with foam mounting tape! I hope this gives you some ideas for the new Sea Treasures kit! Remember, you can subscribe to their no-obligation kits and receive them monthly for $29.99, or purchase them each month for $34.99 (while supplies last). 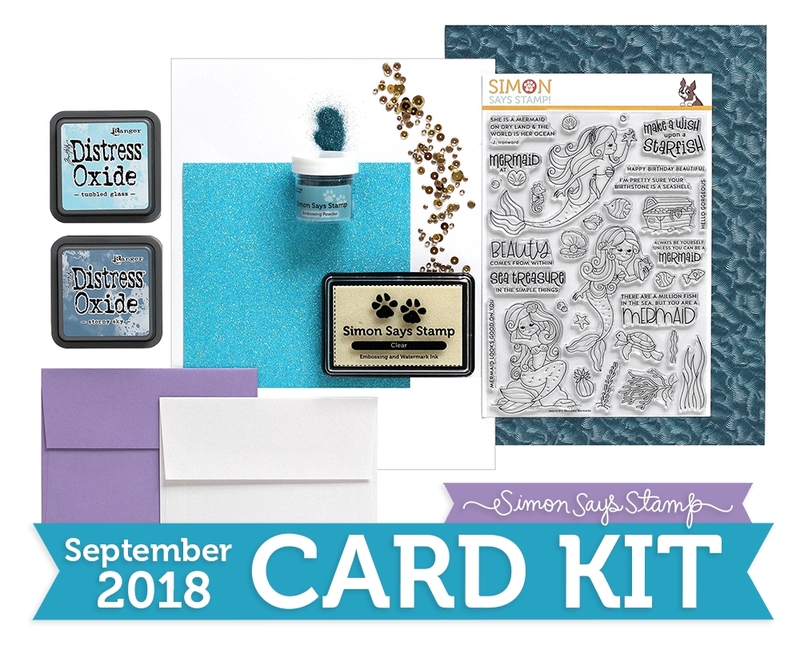 I have a feeling this beautiful kit is going to sell out VERY quickly so if you’re interested I’d recommend heading over and picking up the Simon Says Stamp September kit as soon as possible! 😉 If it sells out you can also find most of the products individually and I’ll link them below! Thanks so much for stopping by and have a wonderful day! The sparkles on her tail are perfect, love it! Oh my goodness, they are like traditional pinup girls, I love that. Plus it looks like there is plenty of room to color everything. And more oxides…….that is generous of SSS! Sorry for huge delay in telling you how fantastic & summer feeling your card is. I do love this set, a definite winner from SSS this month again. Thanks for your inspiration. Love the dark hair. I always give mine red, blonde or pastel hair. Nice to see something different. I LOVE her tail with the tiny dots and GLITTER! Fabulous!